Start with a few irrelevant words about being in city X, the current date, etc. Optional: include some high-level social trends that have nothing to do with the audience, such as growth of consumers in Asia, water scarcity, etc. Call colleague on stage to demonstrate your software (audience wakes up!). We also have services! and training! and partners! Did I mention that there was disruption, and we all need to innovate? Talk to us!/download the product!/buy the product! etc. Go 20% over your allotted time because you’re more important (and nobody dares complain), thank the audience for “holding out” for so long. 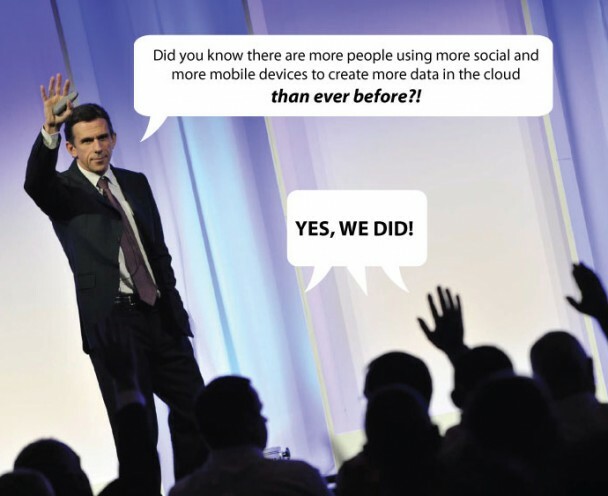 Thank heavens none of this would happen at an SAP event! Did I miss any of your favorite keynote tropes? (I would have said cliché, but that’s a bit of a cliché…) Tell me and I’ll include the best ones! Of course, it’s much easier to criticize than it is to offer useful suggestions — and of course most people only attend a couple a year, so probably don’t feel my pain. In addition, keynote presentations are typically very political, with a certain amount of content that “has” to be covered (product launches, key initiatives for the year, etc.). The only advice I could give is to mix up the format in any way possible, take a few risks (this is one of the reasons that any presentation by SAP’s Steve Lucas is always a pleasure), and talk as much about real implementations as possible. Your turn — what would you like to see done differently in the next conference keynote you attend?